The Douglas DC-5 airliner plays a very important role in several chapters of ‘The Java Gold’. I guess most of you have never heard of this type and don’t have a clue what such an airliner looked like. So here’s a picture of a KNILM DC5. The plane is seen during refuelling at Cloncurry Qld (Thanks Ronald Dijkstra!) en-route on the pre-war Batavia – Sidney service. The plane safely escaped to Australia in March 1942 where it was re-registered VH-CXA. Its career came to an end on August 17,1942 when, during a Japanese air raid at Wards Strip, Port Moresby, New Guinea, it was strafed and destroyed by fire. The DC-5 could be called the Douglas that never was, or that time forgot. The type never was a succes. Commercially it had to compete against the successful DC3. And pilots were not happy with its flying characteristics, many of them complaining about the effort needed to move the heavy controls. The DC-5 was the only Douglas Commercial to be designed and built in the El Segundo plant. This plant had originally been the home of the Northrop Aircraft Corporation which John Northrop had set up with the help of Donald Douglas in 1932. Design of the DC-5 was carried out by a team led by Leo Devlin, and supervised by Ed Heinemann. Based on their experience with the Northrop Delta series and the Northrop 7A and 7B bombers, the El Segundo team decided on a twin-engined high wing configuration and a fully retractable undercarriage. The aircraft was designed to meet a perceived need for a short-haul feeder liner to complement the DC-3 being used on longer routes with heavier traffic. It was to carry a crew of three and sixteen passengers, with the potential to carry twenty-two passengers in high density format. The first flight of the DC-5 was on February 20th. 1939. Orders were received from KLM, Pennsylvania-Central, British Airways, SCADTA of Colombia, and the US Navy Department. The British Airways order was cancelled at the outbreak of war and the deposits transferred to Douglas aircraft for British military use. This was the first British Airways, which merged with Imperial Airways to form BOAC shortly after this. The DC-5’s success was short-lived as aerodynamic problems surfaced during flight testing as excessive tail buffet was experienced due to interference between the wake of the high-mounted wings and engines and the tailplane. This problem was solved by adding dihedral to the tailplane to lift it out of the airflow behind the wing. By this time, World War II had broken out; Penn Central and SCADTA had cancelled their orders, and Douglas had decided to concentrate the El Segundo plant’s efforts on military programmes, notably the A-20 ‘Havoc’ bomber. Therefore only five commercial and seven military versions of the DC-5 were built. The other four were delivered to KLM, with two being delivered to KLM’s West Indies Division in Curacao. These were registered PJ-AIW Wakago and PJ-AIZ Zonvogel. 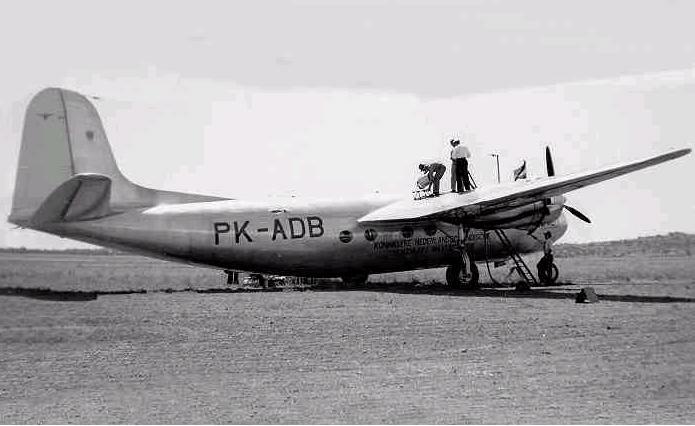 After a year these two were transferred to KNILM as PK-ADD and PK-ADC, following PK-ADA and PK-ADB which went directly to the Dutch East Indies. Three DC-5’s escaped to Australia and were re-registered VH-CXA to VH-CXC. They were bought by the USAAF, together with the ex KNILM and KLM DC-2′,DC-3’s and Lockheed Lodestars. The DC-5’s were operated in Australia and New Guinea by Australia National Airways (ANA) and No. 21 Squadron RAAF. PK-ADA the first of the DC5’s figuring in in Volume 1 of ‘The Java Gold’ was captured by the Japanese and extensively tested. Here’s a rare shot of ex PK-ADA in Japanese livery (at the Tachikawa research centre) where it was paraded with other captured Allied aircraft for a Japanese propaganda film crew. And, as I said, the DC5 plays a most important role in book One of “The Java Gold”. The first picture was taken at Cloncurry, Qld, on the pre-war Batavia-Sydney passenger service. The aircraft was re-registered VHCXA. The other ones as well VHCXA – VHCXC. The aircraft were not impressed, but bought from KNILM and KLM. 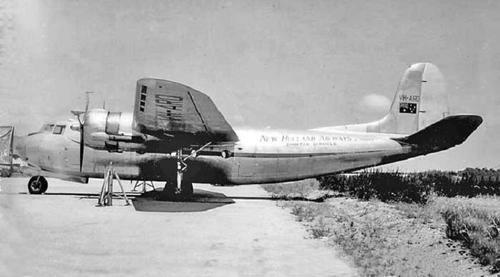 The PK-ADA did survive the war at Haneda and was with most Japanese planes eventually burnt or scrapped. 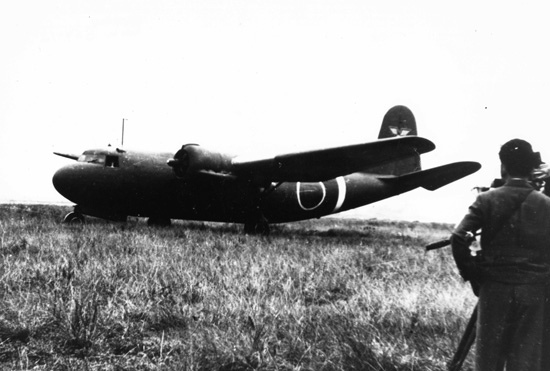 See: Critical Past: Japanese planes parked in airfield of Tokyo Municipal Airport. You’ll see the plane without its engines. Thanks Jacob! Never heard this before. I will add it to the page.